Fighting for Democracy: Who is the "We" in "We, the People"? Through the diverse perspectives of seven ordinary citizens whose lives and communities were forever changed by World War II, this exhibition asks visitors to think critically about freedom, history, and, ultimately, the ongoing struggle to live democratically in a diverse America. Fighting For Democracy: Who is the “We” in “We, the People”? is presented by the National Center for the Preservation of Democracy, an educational program of the Japanese American National Museum, to advance the understanding of, and commitment to, American democratic ideals. For more information about the exhibition and a listing of traveling venues, to explore an online version, or to download the accompanying Educator’s Resource Guide, visit ncdemocracy.org. The original version of Fighting for Democracy opened at the National Center in October, 2005, and was made possible with major support provided by the U.S. Army Center for Military History. This version presents the stories in a self-guided format and has been made possible through the generous support of The Boeing Company and the U.S. Army Center for Military History. PHOTO CREDITS – Bill: National Archives (018-T-44K-13); Carl: National Archives (NWDNS-127-MN-83714); Domingo: Collection of Domingo Los Baños (NCPD.17.2005.104); Frances: From the Frances Slanger Collection in The Howard Gotlieb Archival Research Center at Boston University (NCPD.30.2005.24); George: Gift of Mary S. Tominaga, Japanese American National Museum (94.49.28); Hazel: The Woman’s Collection, Texas Woman’s University (MSS.358); Héctor: Dr. Héctor P. García Papers, Special Collections & Archives, Texas A&M University–Corpus Christi Bell Library (NCPD.1.2004.30). WHAT IS FIGHTING FOR DEMOCRACY? For hundreds of years people have sought a home and future in the United States of America. They came, and still come, in pursuit of freedom and democracy. Yet, the dream of democracy is not without its struggle. Against the backdrop of World War II, a segregated America, and the Civil Rights movement of the 1960’s, ordinary people—through the decisions they made and actions they took—extended democracy’s reach for all. FIGHTING FOR DEMOCRACY is an experiential exhibition based on the lives, actions, and decisions of a diverse group of individuals who sought equal rights for their families and communities during World War II. Aimed at middle and high school students, FIGHTING FOR DEMOCRACY offers hands-on experience in exploring about how women and minorities have expanded the meaning of "we" in "we, the people." When visiting FIGHTING FOR DEMOCRACY, teachers, and group leaders facilitate their students' experience in the exhibition space, allowing educators to custom-tailor an educational focus to meet their curricular goals and to deepen their students' understanding of democracy. Before bringing student groups to FIGHTING FOR DEMOCRACY, educators are strongly encouraged to sign up for a free professional development workshop. These workshops will provide an orientation to the exhibition, preparation on facilitating an interactive experience, and introduction to activity ideas from the FIGHTING FOR DEMOCRACY Educator's Resource Guide that can be done before, during and after a visit to the exhibition. Transportation and free admission is provided for educators who attend the pre-visit workshop on a first-come, first-serve basis. To RSVP for the workshop and book a visit, contact Lynn Yamasaki at lyamasaki@janm.org or call 213.830.5660. Visits to FIGHTING FOR DEMOCRACY are reserved for school and youth groups, by appointment only, Tuesday-Friday 9:00am-5:00pm. Appointments must be made at least 3 weeks in advance by using our online reservation form or by calling 213.830.5660. Fighting for Democracy: Who is the "We" in "We, the People" closes. 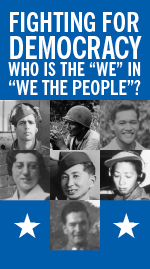 Fighting for Democracy: Who is the "We" in "We, the People" opens.